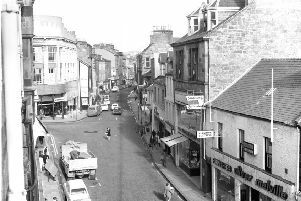 Easter 1977 saw it used as the culmination of Kirkcaldy’s Festival Of Faith – an ambitious celebration organised by local churches. Around 1000 marched in procession from four starting points across the town, led by bands from the Salvation Army, the BBs and the Scottish Ambulance Service. It was a major event in its own right, and marked the end of a festival which featured everything from debate to poetry, from music to films. The festival came at a time of falling numbers attending church. Kirkcaldy 1977 - Festival of Faith. Pictured is Eric Morgan, producer of two rock musicals, with Kirkcaldy Technical College theatre group ahead of their performances. Just weeks before it took place Kirkcaldy Presbytery’s annual head count showed a drop of 700 worshippers – down from 28,166 to 27,400. It launched with a rally at the Congregational Church which “set the tone with its theme of celebration and joy”. What followed was a host of evenings and gatherings aimed at all sections of the community. The most senior Church of Scotland figures came to town, and there were representatives from all denominations. There was a youth festival complete with music and film nights. Kirkcaldy also enjoyed TV coverage via STV’s famous ‘Late Call’ – the late night religious sermons which were a staple part of their output back in the 1970s and ’80s. A 50-strong cast presented Noah And His Floating Zoo, while there was also poetry at St John’s Church because “no festival is complete without poetry”. The Speaker of the House of Commons, the Rt Hon George Thomas MP, sent a personal ‘credo’ for the Focus on Faith show at the Philp Hall, which was hosted by broadcaster Mamie Magnusson, wife of Magnus. That event served up something different – religious entertainment. “When two such disparate items as pop music and a discussion on the power of prayer are put together, it must become either a hopeless hot potch or a fascinating and stimulating contrast, This was certainly the latter,” reported the Press. The festival culminated with the Town Square rally which featured schools, churches, youth groups and the East Fife Male Voice Choir. Overall, the Press appeared to approve.